Opportunity All around - Taking Advantage is up to you. Right now, if you had the opportunity to make a 7% Return on Investment, would you invest? Compared to a bank rate of 0.5% or 1%. A 7% return sounds pretty good. Would it matter what the investment was? And what if that 7% increased each year with no additional investment? Would you invest then? One more thing, what if that 7% return you received was TAX FREE!!! Yes, tax free! Ask yourself. Would you invest then? Before we say more, Let me share a hypothetical situation. Most of us drive a vehicle of some sort. There are costs associated with driving we are all aware of. Mainly gasoline and the high cost of it and when the price of gas increases we have to pay more. We pay because without gasoline the car is of little use and the vehicle is such a valuable part of our lives. Now, what if there was a product that could be added to your car that would eliminate most or all of your gas costs for as long as you have that car and protect you from paying those increases. Wouldn’t you want to know more? And how valuable would that be? The product does exist. But it’s not for your car and doesn’t replace gasoline. It’s for your home and it replaces hydro. In today’s world, most people would say Solar is just too expensive, and many would listen and stop right there. But if you were making a 7% return, would it really matter and wouldn’t you want to know more? Plus the fact that it would protect you from increases of hydro rates. Did you know that people who are on Time of Use rates with their hydro company today can make a 7% Return by installing a small residential solar energy system. And that percentage return would only increase each year. With a 25year performance manufacturer warranty, consider how that might add up. With little to no risk! Just as gas is critical to the car, hydro is to your home and your way of life. We all know when gas increases we pay more out of pocket, and it’s the same with hydro. But Solar Energy has decreased in price so you can now make that great return! Many people invest in a standard GIC just to receive a 2.5% return, which is taxable income! 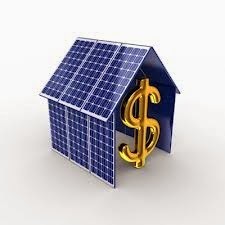 The 7% return through a solar energy system is NON-TAXABLE! That’s right, on top of receiving a great percentage, you CANNOT BE TAXED on the return! I design these systems to help homeowners and businesses achieve these results or even achieve better! If you are a homeowner, or business owner, would you not want to know more? The percentage returns outlined above are for small residential systems. Our custom designed Commercial and Industrial systems can yield even greater returns. Please like and share this post to help spread the word and contact me via linkedin to understand more. 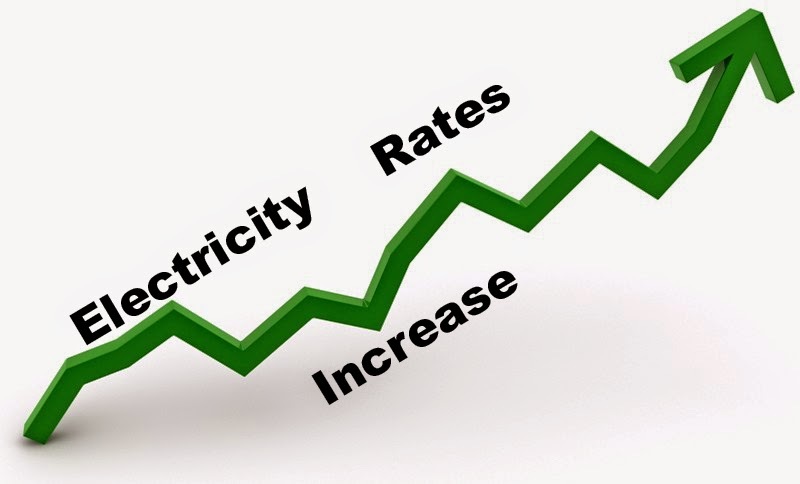 Utility rates continue to go up. everyone knows electric rates go up. But have we really considered the percentages. most people don't really think much about it because it doesn't hurt their wallets as much as other things. And lets face it. We need energy, so what can you do. actually there is plenty and more and more people are waking up to it. I bet most people didn't know in Ontario the average electric rate increases 6% each year on average. I but most people out there didn't get a 6% raise. Given what we already know...consider the future for a moment. In 2013 our local electricity rate increase 8.5% not 6%. 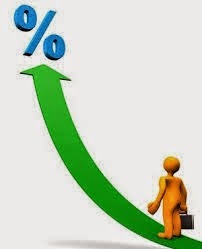 at the end of 2013 rate hikes were approved for the next 5 years to increase rates by more then 40% of what it is today! That's more then 10% per year on average. If that's not bad enough, utility and energy generators have already submitted to increase rates even more! It's not just gas companies any more! To help protect yourselves from insane future bills. TAKE ACTION!!!! 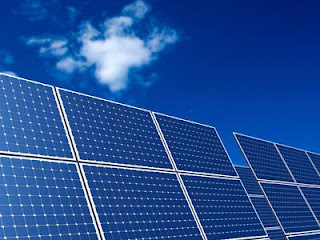 We've put together a quick list of solar energy system kits that will offset your energy bills. By using one of these system you can essentially offset most or all of your energy needs and net your electric bill to virtually $0 energy cost. If your end bill was essentially nothing then increases of any kinds will truly have no effect to you and therefore protects your hard earned money keeping it where it belongs. with you! Consider the solar solution....I've lived with it for years and honestly say there are no regrets! Great investment to protect against futures. Take and look and contact me with any questions, I will try to do what I can to help. A few days before Christmas 2014, Southern Ontario was hit by an ICE STORM. This resulted in so much ice weighing down trees causing them to tear apart and pull powerlines down all over. Hundred's of thousands of people were left without power for days in the bitter cold. It was truely a disaster situation, people were risking carbon monoxide poisoning trying to keep warm. Some people where even operating their bar bq's indoors to create heat. There were even some deaths due to carbon monoxide. That could have been avoided with a power back up system. To help Keep the power on! 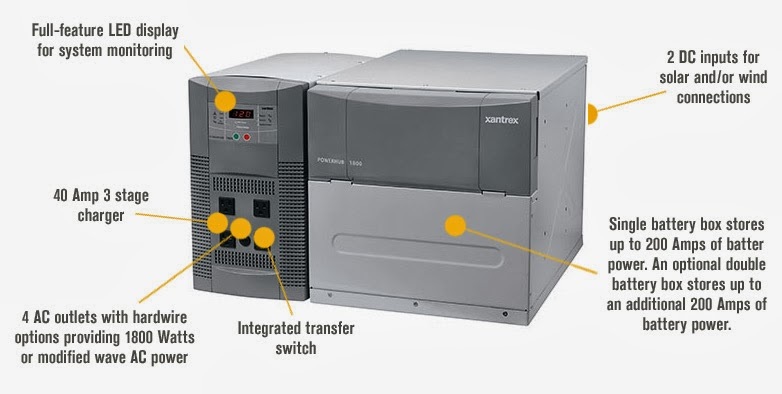 We have a backup power system to provide 1800watts of household power with terminal blocks for 200amp hrs of battery life on a single charge expandable to 400amp hrs. HOME SECURITY SYSTEM FOR 300HRS OR 12 FULL DAYS!!! Don't forget heating....you could operate the blower in a fireplace for 35 consecutive hours and keep your family warm. Keep your business running and don't lose money due to power outage. WITH OPTIONAL EXPANSION UNIT YOU CAN DOUBLE THE RUN TIMES!!!! Perfect for home backup power or cottage. The unit can be recharged by connecting to your car, gas generator, solar modules and even a wind turbine. We've put together a great offer for any Ontario resident who would like to cut their Hydro costs or even eliminate them. These are new Solar Energy system ready to be shipped out. 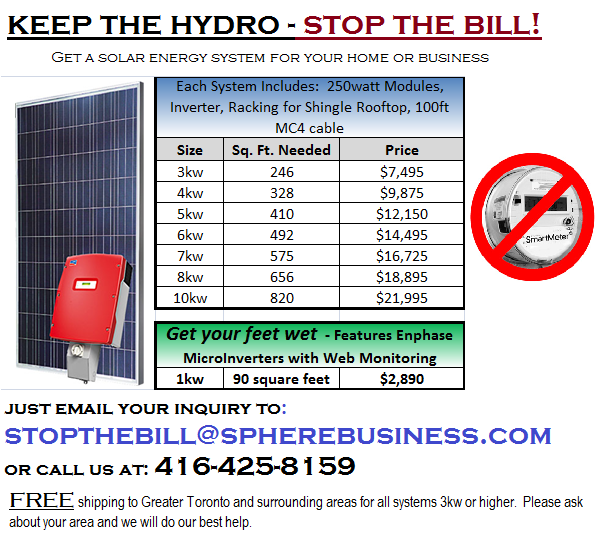 FREE SHIPPING to Toronto, Ontario, GTA and Surrounding area for systems 5kw or larger. Outside of this area please contact as we will do our best to try and accommodate shipping. We have Energy systems from 1kw and up. Just contact email me about what size is right for you. 1kw kit is only $2,890. Cut those bills forever! FREE SHIPPING within Toronto Ontario and GTA. Contact me via email or phone for purchases. Nature is Telling us Something! From time to time nature tends to remind us how fragile our attempts to control things are. The recent storm that swept accross the Greater Toronto Area causing flooding throught the entire city and surrounding areas, was one of those "light" reminders. That just happen to hit a little closer to home for some. Thankfully the storm with all the flodding damage it caused, did not cost a life! However with hundreds or Thousands of people left without power; many for a few days! We are reminded of how fragile our distribution system is. One way to strengthen our system is to produce more power locally. We can all help with installing a simple solar PV system. 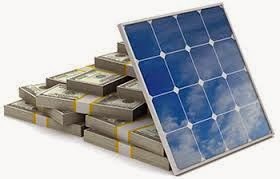 Even a 1kw system will provide a benefit to you and the system. It will lower your electric bill and help provide stability for all. In my own personal example I've managed through energy efficiency measures to cut my energy consumption by 50%. It just take a plan then simply execute. Then with our solar PV system operating on the rooftop we generate enough of our own energy, safely, cleanly and efficiently enough to offset our consumption. This put us in a Net Zero catergory home. Essentially we are a 0 impact home. Just so everyone doesn't think I'm sitting in the dark like some hermit in woods. Here is some of what we are operating. First off the home is separated into 2 fully functioning apartments. So that means 2 refrigerators, 2 Electric ovens, hood fans, central air conditioning, washer/dryer, gas fireplace.... Basically whatever you might expect. In an apartment x2. We just made the effort to adjust the appliances and how we use them to be more energy efficient. Changing light bulbs to CFL's and LED are a great help as well. The adjustments took us half the way and the solar got us over the finish line in achieving a NET ZERO impact. 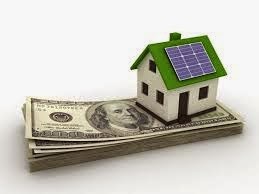 It's possible and we can show you how with a Rapid Energy Assesment for a small fee. If you're interested in saving on your bills and doing your part. We service all over the GTA and many parts of Ontario, Canada! Thanks for stopping by and the read. please help us out and share our post with others and give a click on an ad or to for our sponcers. There are many ways for us to combat Global Climate change and the solution starts with each of us. Simple solutions such as, remembering and training ourselves and children to turn off lights and appliances not in use and changing over light bulbs to CFLs and LEDs. both are great options! To take the solution a step further, each of us have the ability to generate our own energy. Solar PV systems have become much more mainstream, and it's not just a fad. The impact and savings are REAL! The trick is to offset our consumption and understand it a little better. To help understand consider a standard toaster rated at 1000watts. If you run that toaster for 1 hr you consumed 1kwh and you are then billed for that kwh. If you only run the toaster once a day for 2 minutes it would take you 30 days (roughly 1 month) to reach that 1kwh. You pay for that kwh and it must be generated from somewhere, somehow. Typically that power is generated from combinations of hydro, coal fire, nuclear and small percentage of renewables. for the most part these are some of the main things causing global climate change and destroying wonderful natural environments! Why not generate clean energy for yourself, make a statement and be rewarded for it? Even a small 1kw rated solar PV system makes a difference. Consider the toaster example. Typical toaster will use 1kwh of energy per month as above. A 1kw solar PV system, properly positioned will generate between 5-6kwh's on a sunny day in Toronto, Ontario. Therefore in that one day of solar production, your system can produce enough energy to run the toaster for approximately 6 months. Once you understand this principal you can begin to understand benefits to you. However also consider the benefits of what you are doing! A 1kw solar PV system will offset 1 tonne of Co2 emissions each year. Not only do you save money year over year, you are price protected from energy hikes but you also make a great direct impact toward protecting our environment! You simply can't lose! I won't go into the scares of Global Climate change. I am certain we all know them. Instead consider solutions. Solar energy is everywhere and we can do some great things. I've been designing and running solar projects for many years now and I can tell everyone not only does it work and is it worth it, but costs have come down. I encourage everyone who has taken the time to read this article to at least consider contact us and take advantage of one of the offers below.